Orson Squire Fowler (October 11, 1809 – August 18, 1887) was a phrenologist and lecturer. 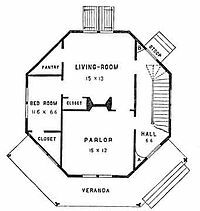 He also popularized the octagon house in the middle of the nineteenth century. 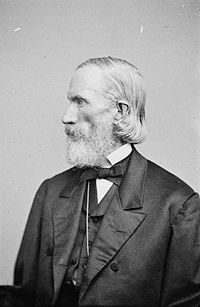 The son of Horace and Martha (Howe) Fowler, he was born in Cohocton, New York, He prepared for college at Ashland Academy and studied at Amherst College, graduating in the class of 1834. With his brother Lorenzo Niles Fowler, he opened a phrenological office in New York City. Orson wrote and lectured on phrenology, preservation of health, popular education and social reform from 1834 to 1887. Lorenzo and his wife Lydia Folger Fowler lectured frequently with Orson on the subject of phrenology. The three were "in large measure" responsible for the mid-19th century popularity of phrenology. The practice of phrenology was frequently used to justify slavery and to advance a belief in African-American inferiority. Fowler wrote that coarse hair correlated with coarse fibers in the brain, and indicated coarse feelings; that, he wrote, suggested that people of African descent had poor verbal skills and traits that were best suited for nursing children or waiting on tables. At the same time, the phrenological journal edited by Fowler and his brother expressed strong abolitionist sentiments, calling slavery a "a monstrous evil." Fowler's writings were also anti-Semitic. For instance, in "Hereditary Descent" (1843), Fowler wrote that Jewish people were hereditarily acquisitive, deceitful, and destructive (phrenology believes that none of these "organs" are negative as such, but all can be used for good). Orson edited and published the American Phrenological Journal, Philadelphia, Pennsylvania, from 1838 to 1842. He was a partner with Fowler & Wells, publishers, New York, from 1846 to 1854, residing in Fishkill, New York, and Elizabeth, New Jersey. His sister, Charlotte Fowler Wells, and her husband, were involved in the publishing house, and after it became a stock company, she served as president. He moved his office to Boston, Massachusetts, in 1863, residing in Manchester from 1863 to 1880. He resided in Sharon, New York, from 1883 until August 18, 1887, when he died. Fowler was married three times: to Mrs. Eliza (Brevoort) Chevalier; to Mrs. Mary (Aiken) Poole; and to Abbie L. Ayres. He had three children. The town of Fowler, Colorado, is named for Fowler. Fowler too had an influence on modern psychology. He is remembered as a man of universal reform who preached for education, temperance, and equality. Orson, like his sister-in-law Lydia Fowler, held forth for the equality for women at a time when women had virtually no legal rights in the United States. Orson stood for children's rights when child labor was quite acceptable in the burgeoning industrial factories of his country. Fowler as a book seller and publisher was crucial in the original publication of Walt Whitman's Leaves of Grass and other works. ^ "Noted Phrenologist Dead: Lorenzo N. Fowler Succumbs to a Paralyzing Stroke" (obituary), The New York Times, 4 September 1896. ^ Engs, Ruth Clifford. Clean Living Movements: American Cycles of Health Reform, p.71, "The Fowlers" in "Inherited Realities, Phrenology, and Eugenic Undercurrents". Greenwood (2001). ^ Madeleine, Stern (1971). Heads & Headlines: The Phrenological Fowlers. University of Oklahoma Press. pp. 99–123. ISBN 0-8061-0978-5. Applegate, Debby. The Most Famous Man in America: The Biography of Henry Ward Beecher. Doubleday, 2006.